Middle Eastern herb mix, Za’atar, mingles with Middle Eastern spice mix, Ras El Hanout, in this 7-ingredient, keto, taste-bud tantalizing, and, super easy Za’atar Ras El Hanout Chicken Spinach dinner. My daughter says that she feels like she is on an episode of Guy’s Grocery Games, when she goes shopping with me. I usually have a list and race down only those aisles I need to, then it’s through self-checkout and I’m homeward bound! However, the other day I had some time to kill, and, found myself wandering down the spice aisle at Walmart. This isn’t a sponsored post, but, in my opinion, Walmart is seriously upping their game when it comes to spices. Their spices might not be as budget-friendly as The Dekalb Farmers Market’s, but the variety is epic! While wandering that spice aisle, I came across bottles of Za’atar & Ras El Hanout. Growing up in the middle east, I was fortunate to have tried a variety of dishes at restaurants flavored with Za’atar or Ras El Hanout. Since attaining adulthood, I’ve always been curious about experimenting with Za’atar & Ras El Hanout, so, this was my chance! By the way, Za’atar is a highly aromatic spice mix, usually consisting of sumac, sesame seed and herbs. It is popular in Middle Eastern and Mediterranean cuisine. Za’atar spiked olive oil is delicious on bread as is za’atar spiked cream cheese. Ras-el-hanout is also highly aromatic and is usually a blend of sweet and savory spices such as cardamom, coriander, fenugreek, cumin, cloves, turmeric and nutmeg, to name a few. Ras El Hanout is quite popular in North African cuisine and delicious as a rub or in stews and soups. I brought home bottles of both and got to experimenting. One night, I baked up some chicken drumsticks – I rubbed a couple of them with Za’atar & another couple with Ras-el-hanout. My daughter ended up LOVING the drumsticks flavored with Za’atar & I loved those with Ras El Hanout. Well, last night I figured I’d try combining aromatic and inviting Za’atar & Ras El Hanout together in a rub for some chicken things. Now, this isn’t a recipe that requires exact measurements. If you want to add less or more Za’atar or Ras El Hanout or chose to not use your teaspoon or tablespoon to measure these quantities out, go for it! Getting back to this Za’atar Ras El Hanout Chicken Spinach dinner… Y’all! Those thighs! While they were sautéing, and the aroma filled our kitchen, my mouth began to water. 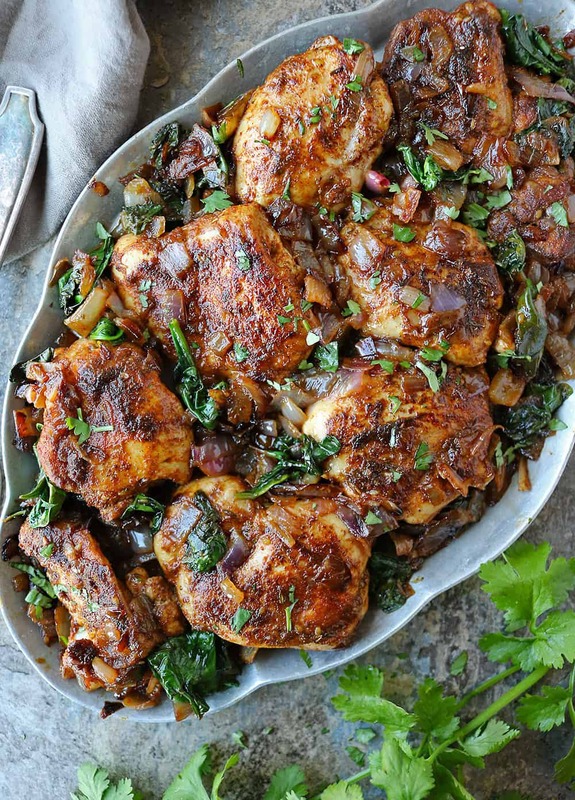 When we took our first bite of this Za’atar Ras El Hanout Chicken Spinach dinner… aaaahhh…. this were so deliriously delicious! 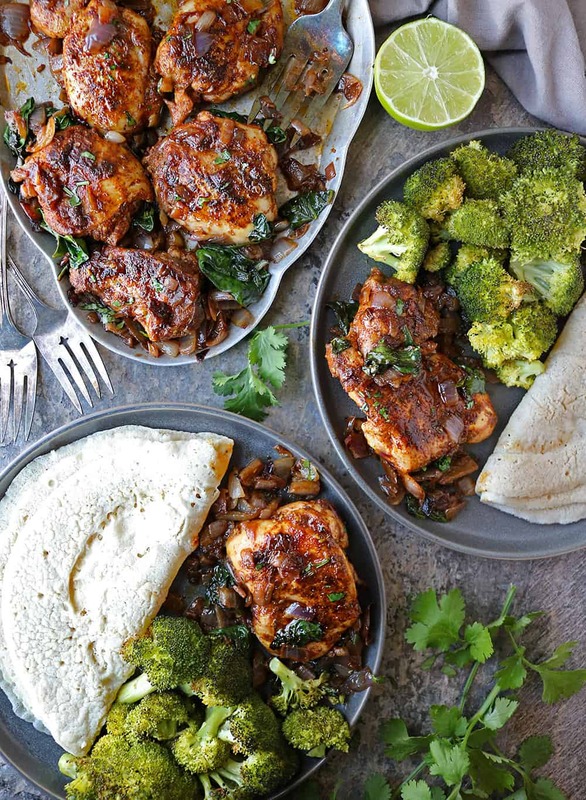 We enjoyed this Za’atar Ras El Hanout Chicken Spinach with some roasted broccoli and some Sri Lankan thosai my mom sent home. But, this pairs well with rice or roti, even. Have you tried Za’atar &/or Ras El Hanout? If so, what is your favorite recipe with Za’atar &/or Ras El Hanout? And, if you haven’t… please grab some bottles of Za’atar and Ras El Hanout and give this Za’atar Ras El Hanout Chicken Spinach dinner a try! Mix together the Za'atar, Ras El Hanout, and smoked paprika. Wash and dry the chicken thighs. Trim any extra fat (if you choose to) and cut each thigh in half so it cooks thoroughly. Then, rub chicken thighs with Za'atar, Ras El Hanout, and smoked paprika mix. (*See Notes for an easy way to do this). Add oil to a pan over medium heat and add chopped onion to it. Saute onion for about 10 minutes, stirring often, so it doesn't burn. Then, add in the rubbed chicken thighs and saute 5-7 minutes on one side, until golden. Squeeze in the lime juice then flip the chicken and saute another 5-7 minutes. Add in the spinach and cook a couple more minutes or until spinach is wilted. 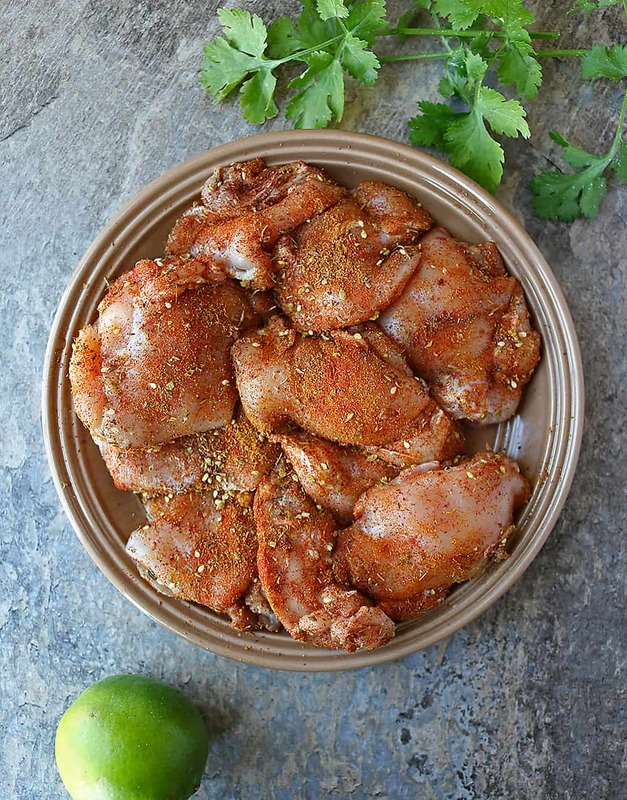 *If you don't want to get down and dirty and rub the spice mix into the chicken thighs with your hands - you can easily mix the chicken thighs with Za'atar, Ras El Hanout, and smoked paprika by placing all the ingredients in a plastic gallon size bag. 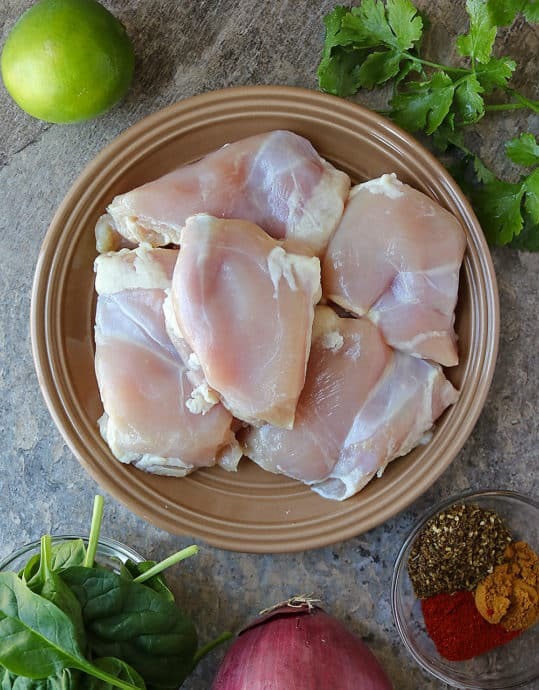 Shake well and make sure to distribute the spices around the chicken - makes for mess-free chicken rubbing! Mayn!! That looks so flavorsome, juicy and delicious! I totally need to try this recipe out! I’m sure those Middle Eastern spices are just incredible! I can’t wait to make this for dinner this week! I am loving all the flavours going on here. This looks like a delicious way to flavour chicken. This is totally flavorful.Have to try this recipe for my family. Looks delicious. I adore Za’atar and Ras El Hanout! This looks so delicious and loaded with flavours! Shashi, your visits to the supermarket with your daughter sound very similar to mine with Lynne! She wants to amble up and down the aisles whilst I have a list and I know exactly what I want and I just want to get what I want and get out! 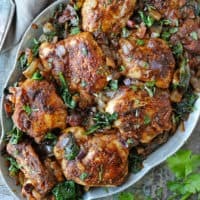 I need to check out these unique Middle Eastern spices that you mention as this recipe looks absolutely amazing. Thanks for enlightening me! You know, I’ve noticed that Walmart has upped their game lately, too. Just yesterday, I saw that they stock harissa now. A couple of years ago, I visited every grocery store in town, and no one had even heard of harissa. I haven’t looked for Ras El Hanout yet, but I’ll put it on the list. I’ve been intrigued by this spice blend for a while…mainly because it sounds like a villain from Batman. 🙂 Seriously, though, you killed it with this recipe. 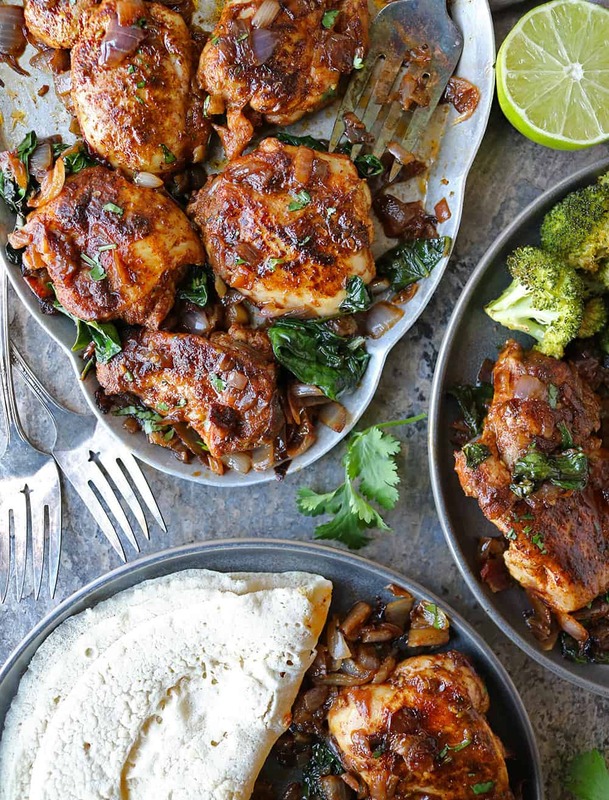 That chicken looks delicious for an easy dinner!! TONS of flavor in this dish! Really good recipe — very creative. Thanks!